I would say Tara is one of the Slovenian beauty bloggers I like the most when in comes to the nail art, but it goes even beyond that – she is one of my favorites worldwide. She has eye for colors and design that melts even my “simple manicures only” heart. When I asked Gejba, if she had any »requests« what I shall write about, she gave me totally free hands, so this is what I ended up with. 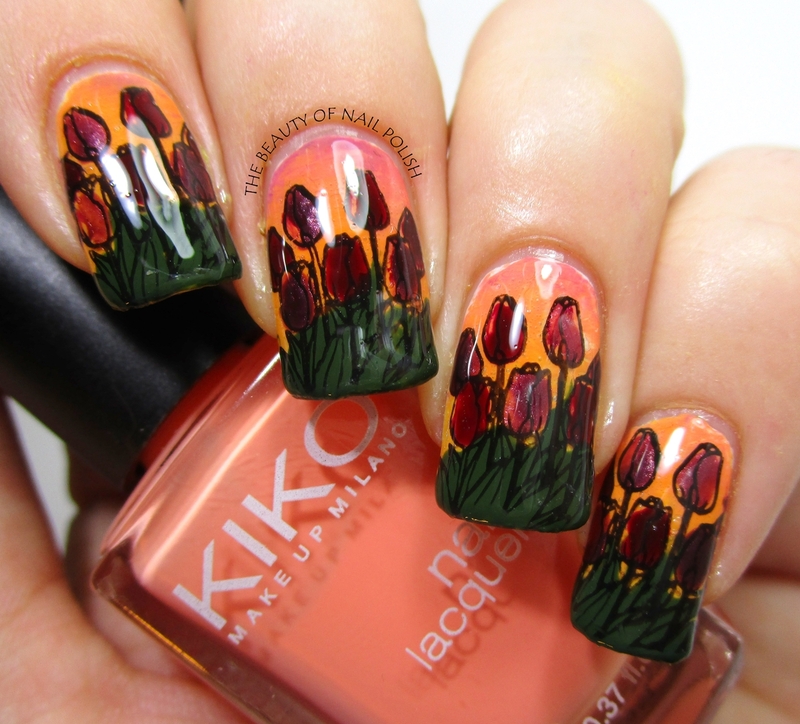 I like spring very much, and you all will agree that tulips are the flowers of spring. 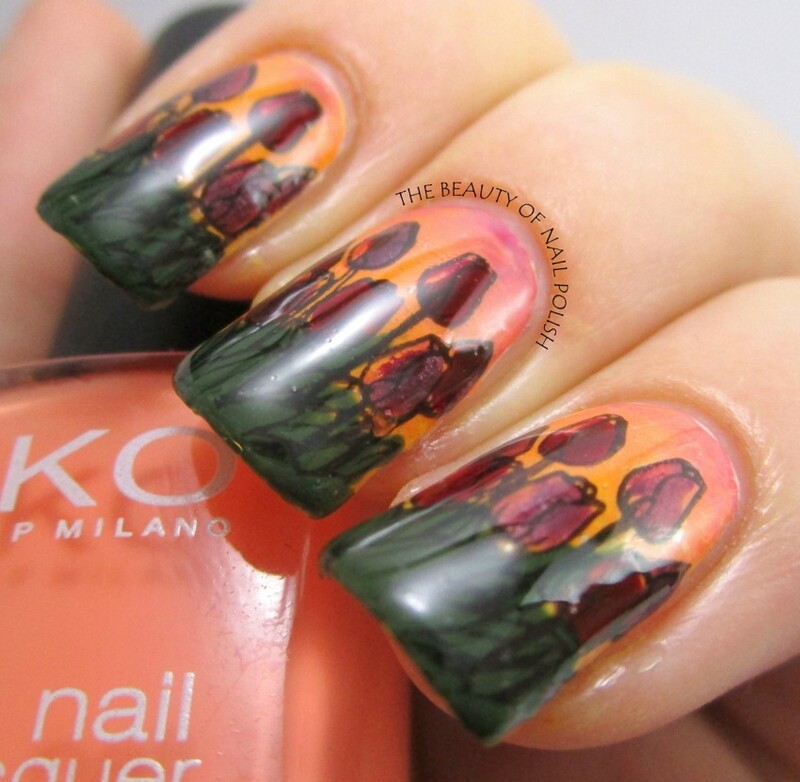 And they look even better in sunset, right? I started with my favourite Catrice – Brightening Base Coat. 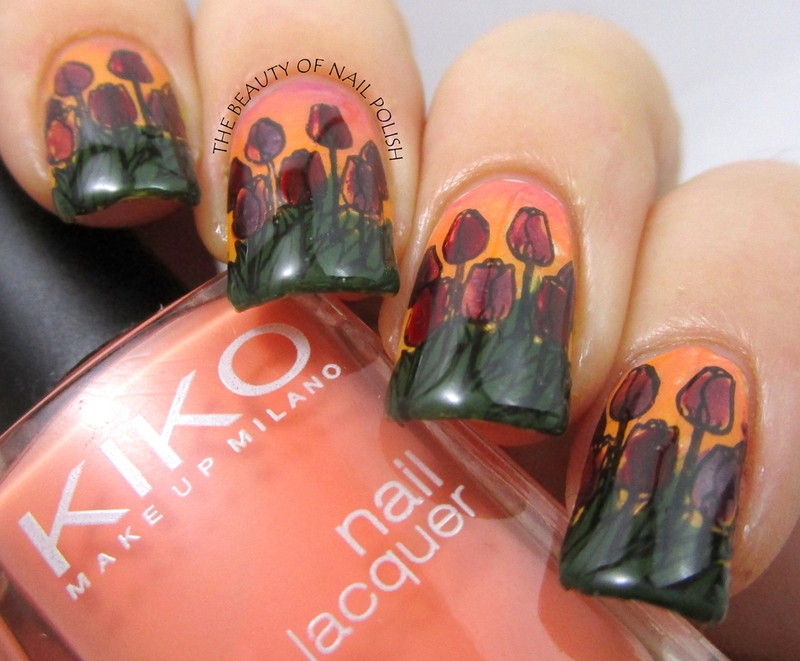 Then I did the sunset gradient using my new Kiko polishes: Canary Yellow, Tangerine and Light Peach and the purple China Glaze – X-Ta-Sea. I am not sure if you are familiar with my technique for making gradients, so I will just mention I am doing them with a fan brush and not using a make up sponge. There is a tutorial on my blog, so if you are interested in details, head over and check it out. I used my beloved MoYou London Pro 08 stamping plate and Mundo de Unas – Black stamping polish to make my stamping decals (this tutorial is also on my blog). 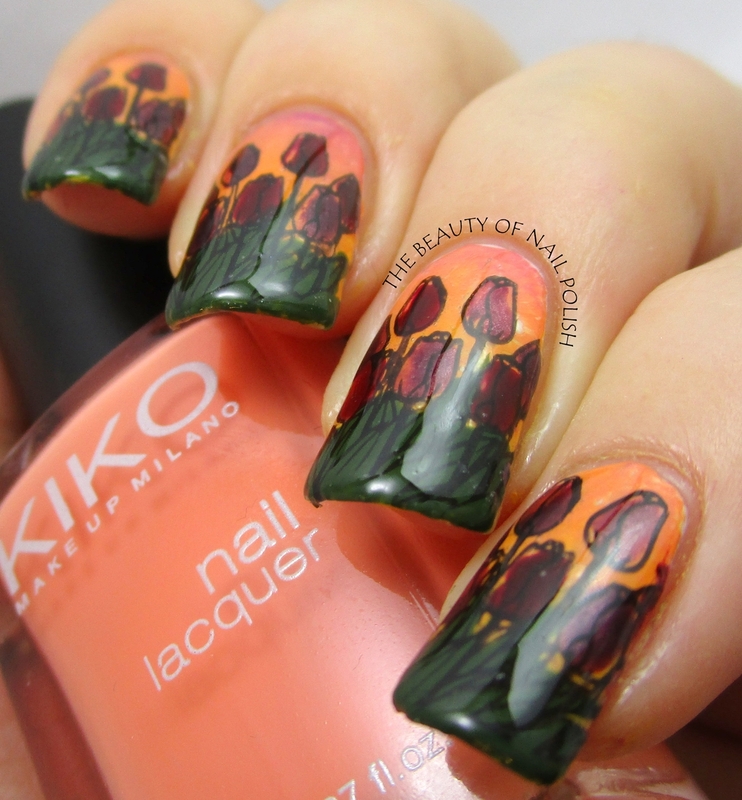 The tulips are filled in with OPI – Vampsterdam and Dance Legend – Katya. Grass is painted with Sally Hansen – Ever Green. 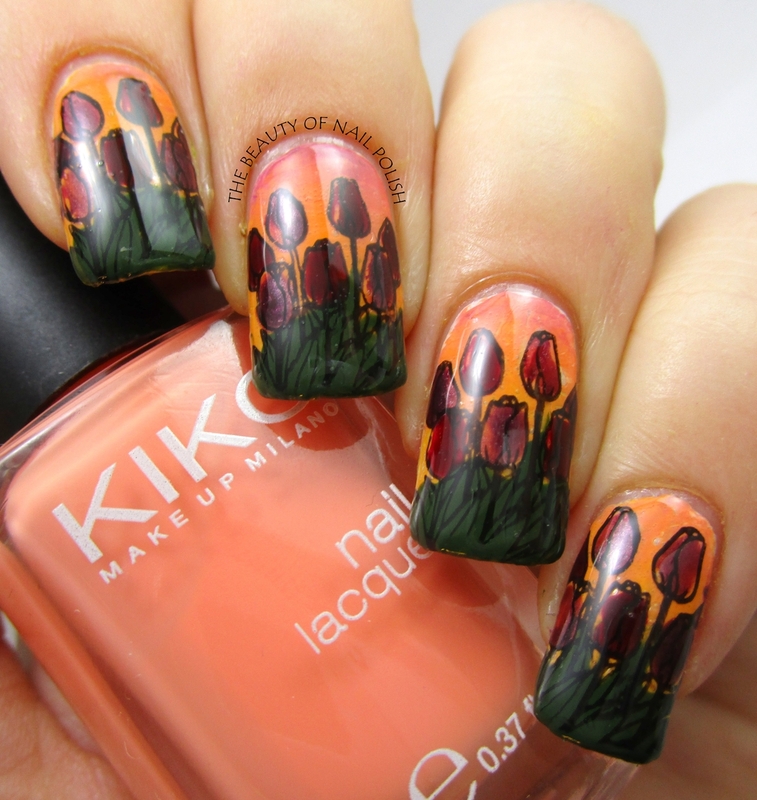 I transfered the decals to my nails using Essence – Sealing Top Coat. I did some fast clean up, and applied a coat of Poshe in the end. We came to the end of my today’s guest post. I hope you enjoyed reading my post and looking to the pictures. Also, I hope this manicure brings some spring into your life as well… And of course, thank you Gejba for inviting me – it was my honor!